For 18 months, Navada Smith showed up at a construction site every morning at 8 a.m., wearing steel-toe boots, a coverall and work glasses. He engaged in all the activities one might imagine happen on such a site- shoveling, painting, repairing things. Among other things, he learned that hard labour is just that- hard. It is not suited for everyone and even for those who do this type of work, it can burn out a body pretty quickly, but Navada not only survived, but thrived. Judging by his small frame and the fact that he had never done anything like this before, one might think that would not have been the case. “It was a lot of hard work,” the 22-year-old says. A lot of hard work and dedication and consistency. In 18 months, Navada was late only once. For this, Navada received an award: Most Discipline. He earned this award by participating in a Ministry of National Security work/training initiative called the Citizens’ Security and Justice Programme. 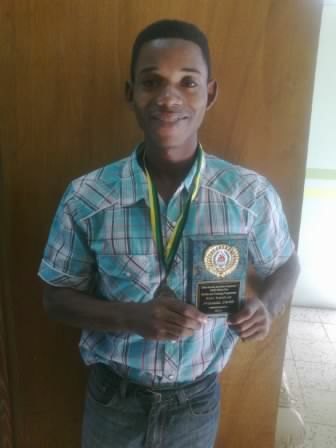 In addition to the recognition for his work ethic on the construction site, Navada received an award of Distinction for his output on a Web Design course he took through the same program. (CSJP began in 2009 as an effort to combat crime and violence. It implemented programs in 39 “vulnerable and volatile” communities such as employment training, life skills and parenting workshops. Youth Opportunities Unlimited was involved in CSJP, and Navada was one of the youth who participated). Navada is from the community of Mountain View, which as suffered from violence and shootings in the past. Growing up, he says, was not hard, but being exposed to the violence was. “It was violent around other communities. We could hear gunshots at night and we couldn’t sleep,” he says, adding that the gunmen only came out after midnight.